Late last summer someone handed me a curious USB device that I popped in my bag and then sat on my shelf until today when I thought it was about time I plugged it into my computer to see what it did. 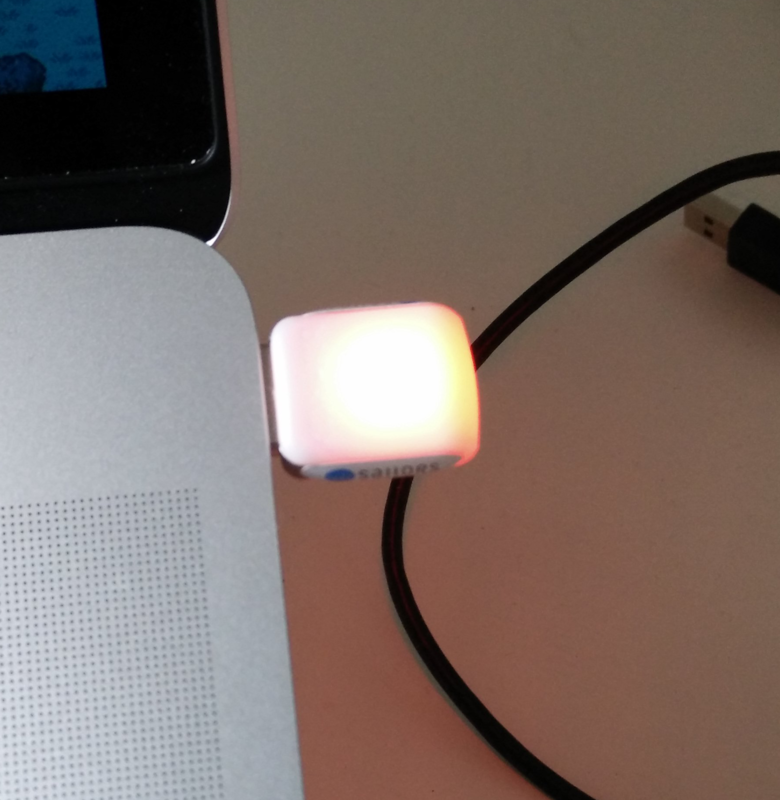 That device was the Blink(1), a fully open source USB powered indicator light that is highly programmable and customizable to suit just about any need you might have for a… USB powered indicator light. As niche as a device as this may sound, it claims users at companies such as Pixar, Microsoft, Sharp, Twitter, Google and other large companies. The problem with a hardware device is that you need to get your hands on one. The Blink is affordable (Less than 30 dollars or euros) and easy to find. If you like what you read here maybe you’ll get one for yourself, or wonder why on earth you may care about a programmable light. All of Blink’s software is free and open source and you can download a Mac and Windows GUI, a CLI tool and a myriad of Libraries and SDKs, some of which we’ll cover here. The GUI application gives a lot of control over the Blink and will cover a lot of use cases you might have. Start: Quick access to enabling and disabling the blink’s default patterns. IFTTT: Reacting to IFTTT recipes, which we’ll cover next. Tools: Adding scripts or URLs of scripts that can control the Blink. Mail: Checking email accounts to trigger light patterns. Hardware: Reacting to battery, CPU and RAM changes on your local machine. Many of the elements of the Blink Control app are reasonably self-explanatory and work well, but as is typical with Kickstarter / Open Source projects, I found a issues here and there (most crucially, if the GUI is open, the CLI tool wont work), but nothing a developer wont be able to work through. Let’s try setting up one of the most flexible and potentially useful sections and set up an IFFTTT integration to flash when a GitHub issue is assigned to us. 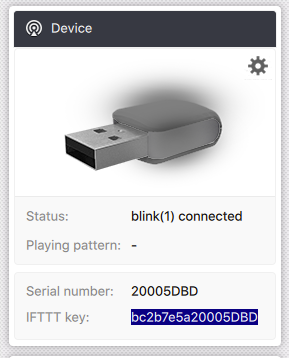 First we need the Blink’s IFFTTT key, found on the left hand side of the control application. Next, find and set-up the IFFTTT recipe that connects GitHub to Blink, adding your IFFTTT key when promoted. Make sure you name it something machine-readable as we will need this later, i.e. 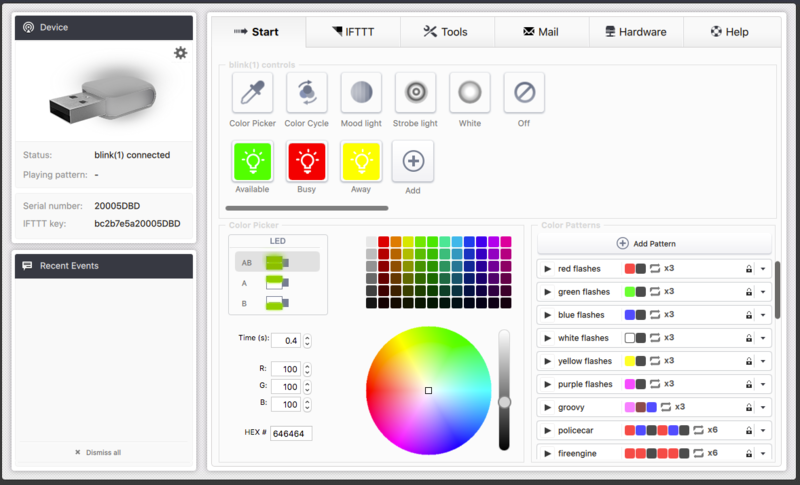 Now add a matching IFFTTT rule in the Blink Control application, naming it the same as the rule and setting a light pattern of your choosing. The Blink Control app allows us to do a lot, but is most useful when combined directly with an application flow and this is where the Blink excels. The Blink has client libraries for Java, Node.JS, Python, Go, QT, C, .Net, Ruby, Command Line and REST API, so offers possibilities for connecting with almost any application you might care to connect to. One obvious use case is for status updates from continuous integration systems and there are pre-exisiting libraries for Travis, GitLab and TeamCity with any other build tool supportable via writing a language specific plugin or using REST. Controlling the Blink is a case or telling it to turn on or off and what pattern of colors to display. If you are using a client library or the REST interface, the principles are the same. Read more about what’s possible with the interface here. As you can see, the Blink just does one thing, but the possibilities and means for making it do that one thing are almost endless. If you have a use for such a device, you likely are already convinced. If you don’t have a practical use, the Blink may be a great visual tool for learning to program as the instant feedback is satisfying. I’d love to hear what you would do with a Blink, I’m off to write a script to notify me when this article receives a comment.